Nissan India has announced that the launch of the new 2017 Terrano is set to happen on March 27. The new model will feature aesthetic changes as well as a few feature additions. It was only a few months ago that Nissan launched the AMT variant of the Terrano, and now it seems Nissan has decided to restyle its compact SUV to keep up with the competition. The Nissan Terrano is based on Renault's compact SUV, the Duster. It was launched in the Indian market back in October 2013, but did not manage to keep up with competition as the Renault Duster always sold in better numbers. 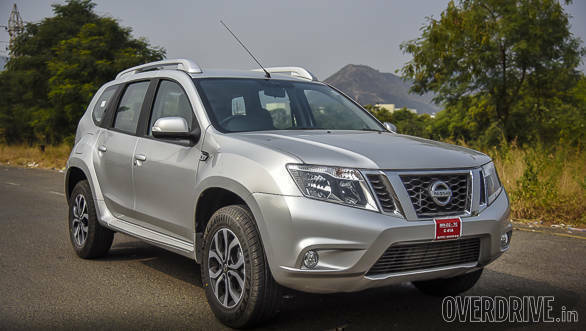 Nissan had launched only one special edition in 2015 called the Terrano Groove, but that too did not help much in terms of sales numbers. With the 2017 facelift, which will be the first proper update for the compact SUV since its launch, Nissan will be hoping for better performance in the market. The front end of the new Terrano will feature redesigned headlamps with LED DRLs and a restyled bumper and grille as well. The side profile will probably get new alloy wheels while the rear end will get restyled LED tail lamps and a new bumper too. While the exterior of the car receives a few changes, we expect to see more changes inside the car too. There will be no major changes in overall cabin layout, but the dashboard will be made of soft-touch plastics and will feature a touchscreen infotainment system and automatic climate control. Other features that could be added to the car include electric-folding ORVMs, anti-pinch driver's window and a reverse parking camera. With most of the competition offering higher levels of safety, Nissan might also consider doing so, by offering ABS with EBD and dual front airbags as standard. The 2017 Nissan Terrano will feature no mechanical changes and will continue to be powered by the same set of engines. The diesel variants will be powered by the 1.5-litre K9K turbo-diesel engine, which will be available in two states of tune  85PS/200Nm or 110PS/248Nm. The petrol variants are powered by a 1.6-litre naturally aspirated engine with an output of 104PS and 145Nm. The 110PS diesel variant is available with a 6-speed AMT gearbox while all other variants will be driven by a 5-speed manual gearbox. Expect a slight increase in prices for the facelifted 2017 Nissan Terrano.